Come visit “Beautiful Vermont” entice the travel posters. Yet if our own President or Vice President of these United States set feet upon the streets of their Brattleboro paradise, Vermonters are ready and willing to slap the cuffs upon them and haul their clothed fannies off to the slammer. If the most powerful people in the nation must shudder with fear to visit such a place; if President Bush and Vice President are in peril in Vermont where they have been threatened with arrest for war crimes, why would any of us lesser mortals of the lower forty-eight travel there for fun and relaxation? We would not – not unless we leave our clothes behind or are as loony as the Vermonters, themselves! We’ll travel elsewhere. Is our President Bush in danger of imprisonment as a war criminal? Probably not, as he has already served six years in office visiting every state in the Union except … TA DA …. Vermont! He’s no dummy nor is he as loony as the Vermonters. And he’s a whole lot smarter than anyone planning a vacation trip to Vermont. Let’s see if I have this right. While American soldiers are fighting and dying to protect the right of nudists to freely stroll the byways of Vermont, and to guarantee that contented cows may safely graze and give cream for Vermont’s exports, and to protect their fellow countrymen from being blown up in the middle of the sky, the ungrateful Vermonters are busily drafting indictments against the Commander in Chief of those same soldiers. This is happening in Vermont, while the rest of the nation is in a state of war. How about you show a bit of respect, Vermont? You may start by finding enough clothing somewhere to cover your too fat fanny. 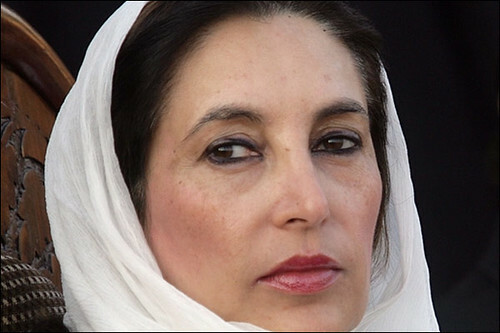 It was the “Fear of Freedom” which begot the murder yesterday of a woman freedom fighter, Benazir Bhutto. She was a Muslim woman, a Muslim mother who, because she believed in freedom, was martyred in her own native Muslim land of Pakistan by her fellow Muslim brothers. Where religions, creeds, nations and lands espouse “Fear of Freedom”, truth becomes an unknown commodity. All truth is from God; freedom is God’s gift to all of mankind. Those who teach “Fear of Freedom” to their people are enemies of the true God. Yesterday’s tragic murder of a woman for her belief in freedom is one more example of the “Fear of Freedom’s” tyranny of the human mind, its debasement of the human soul and its degradation of human life on earth. Thank God for the man named Jesus who preached freedom. Jesus taught HIS followers to seek freedom, not to fear it, and hence influenced HIS civilized world to carry freedom’s torch: “And ye shall know the truth, and the truth shall make you free” (John Chapter 8). “I’m standing up for the principle of democracy. I’m standing up for moderation. And I’m standing up for hope for all the people in Pakistan who today are poor and miserable and really quite desperate..” ~~ Benazir Bhutto, CNN Interview of 28 September 2007. In 1775, Patrick Henry delared “Give me Liberty or Give me Death,” at Saint John’s Church in Richmond, Virginia. That declaration set the course for revolution and independence for Americans. It was the cry that has reverberated in the hearts of mankind ever since. Many freedom lovers around the world have met death in their quest for liberty for themselves and others. Today it was the American educated woman freedom fighter, Benazir Bhutto, who was martyred in freedom’s name in her own native land of Pakistan. Today, it was a Muslim woman, Benazir Bhutto, murdered in a Muslim land, by her fellow male Muslims. BBC News. The image, Benazir Bhutto last moments-5, is subject to copyright by PAKlSTAN. It is posted here with permission via the Flickr API by Kerfuffles. Pity the Prez. Even his own father, the former President George Herbert Walker Bush, has gone over to the Clinton side. The news is just in that as soon as his son, the current President, is booted out of office, President George H.W. Bush is planning a world wide mission to repair the damage that said son has done to America’s image in the world. How do we know this to be true? Because another former President is reporting it, and as we know, former presidents don’t lie. According to Bill Clinton: “George H.W. Bush to Help President Hillary Clinton“, thus reports CNN. ORANGEBURG, South Carolina (CNN) – Former President Bill Clinton said Monday that the first thing his wife Hillary will do when she reaches the White House is dispatch him and his predecessor, President George H.W. Bush, on an around-the-world mission to repair the damage done to America’s reputation by the current president — Bush’s son, George W. Bush. It is times like this that try a President’s soul. It is times like this when a President may yearn to be an orphan. Lord — Save Us from Hate! If you don’t care because you are not a Mormon, then wait until they come for whatever creed or religion or non-religion that you espouse. You will care about virulent hatred then. Who’s the Brother of Satan? WASHINGTON, Dec 12 (Reuters Life!) – Republican presidential candidate Mike Huckabee … questioned whether Mormons believe “Jesus and the devil are brothers.” Huckabee raised the question on his own in an interview to appear in The New York Times magazine on Sunday …. After a debate in Iowa on Wednesday, Huckabee apologized for the comment … . “I went to Mitt Romney and apologized to him, because I said, I would never try, ever, to try to somehow pick out some point of your faith and make it, you know, an issue,” he said on CNN. But it was Huckabee’s question about the relationship between the devil and Jesus Christ in an upcoming Sunday New York Times Magazine article that had Iowa voters rushing to support the most Reverend Mike “The Bigot” Huckabee. the Prayer Bear that comes with a prayer rug and a compass. WARNING: Do not give these CAIR Bears as Christmas or Hanukkah gifts. One person has already suffered for doing so. She purchased the Prayer Bear and then placed him upon his prayer rug, which she mistook for a magic carpet. She commanded him to fly around the room. He did just that while mumbling some Arabic gibberish, then landed under her Holiday tree, lit a fuse in his bear paw and blew up the entire family room. The image, Mohammed Bear, is subject to copyright by j.fishers. It is posted here with permission via the Flickr API by barneykin. You are currently browsing the Kerfuffles and Flourishes blog archives for December, 2007.